Posted September 17th, 2017 by Mike Boyes & filed under Aggression, Altruism Prosocial Behaviour, Group Processes, Psychological Health, Social Psychology, Stress, Stress Coping - Health, Stress: Coping Reducing, The Self. Description: How would you like to spend 8 MONTHS in Hawaii? Are you down with that? OK well what if the 8 months were to be spent on a plateau just below the summit of the still active Mauna Lao volcano on the Big Island on a simulated Mars mission with 5 other people living in a 1200 square foot Martian bubble? Oh you get to go outside but only when wearing a “space suit” and on a science mission. If you are wondering what that would be like keep your eyes on the news over the next couple of weeks because the participants in the 5th of 6 such simulated Mars missions (the latest one was for 8 months and the next will be for a full year) are “coming back to Earth” today (Sunday September 17, 2017). Think about what sort of psychological questions or hypotheses you would like to see addressed by this sort of simulation and think about how the data could be gathered and how it might be applied to the design of actual missions to Mars then read the article linked below that talk about the mission/experiment whose data gathering phase is winding down today. 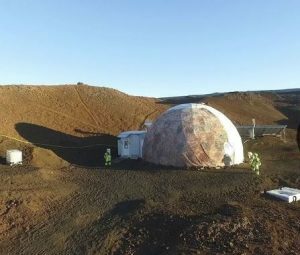 Source: Psychology experiment kept 6 NASA subjects isolated on a Mars-like volcano for 8 months, Caleb Jones, Associated Press. So did the article provide you with tidbits of information that addressed at least some of your hypotheses? Well perhaps not if like me you found the article “light” on the psychology. It did, however, provide some interesting bits like the inevitability of conflict in close quarters and the use of virtual reality in ways perhaps like the “holodecks” of the Starship Enterprise as a means of gaining respite while not physically actually getting away. What sort of data should they have gathered (some is described but more information would be more informative). What sorts of social and psychological stressors might arise for participants in this sort of “experiment”? What sorts of things might be provided, trained, or offered in such situations (real or simulated) to contribute positively to both Psychological the wellbeing and to the cognitive functioning of participants? What sorts of data gathering methods, including but going beyond those mentioned in passing in the article, would be of assistance in providing data needed to address your questions about psychological issues and impacts of this sort of mission/experience? Anderson, A. P., Fellows, A. M., Binsted, K. A., Hegel, M. T., & Buckey, J. C. (2016). Autonomous, Computer-Based Behavioral Health Countermeasure Evaluation at HI-SEAS Mars Analog. Aerospace medicine and human performance, 87(11), 912-920. Caraccio, A., Hintze, P. E., & Miles, J. D. (2014). Human Factor Investigation of Waste Processing System During the HI-SEAS 4-month Mars Analog Mission in Support of NASA’s Logistic Reduction and Repurposing Project: Trash to Gas.